This weekend we had the pleasure of meeting Carina. She is a 3 Year old, 16lb, Pomeranian. 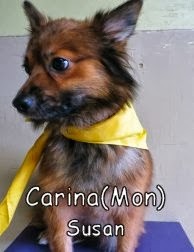 Carina has a very calm and relaxed personality and was great at communicating with the other pack members. Carina had a great time socializing with the other dogs upstairs and especially enjoyed playing with Kirby & Seamus. Carina did a great job on her assessment and she is welcome back anytime.